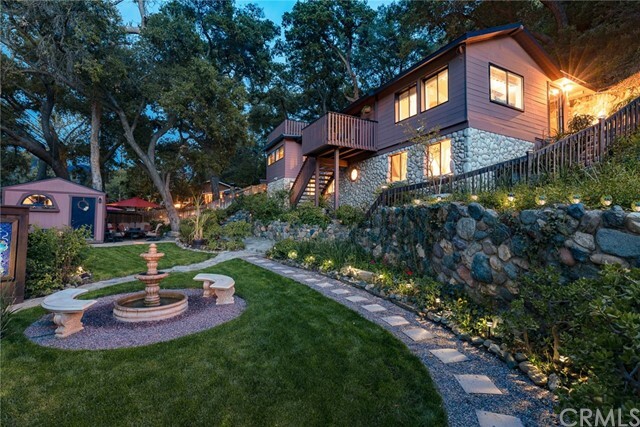 All Modjeska Canyon homes currently listed for sale in Modjeska Canyon as of 04/25/2019 are shown below. You can change the search criteria at any time by pressing the 'Change Search' button below. If you have any questions or you would like more information about any Modjeska Canyon homes for sale or other Modjeska Canyon real estate, please contact us and one of our knowledgeable Modjeska Canyon REALTORS® would be pleased to assist you. "Located in beautiful Modjeska Canyon rests this newly constructed view home on 6 acres with the rare opportunity to enjoy country living in Orange County just minutes from the toll roads & city. Zoned for agriculture and ranch, this ultimate property offers multiple opportunities. The wine enthusiast can build a dream vineyard. The car collector can store their priceless classics between 2 custom garages. Mountain bikers and horse lovers can take advantage of the National Forest trails for rides. The chicken coop houses laying hens while 4 horse stalls and a tack shed are ideal for barn and storage. Cross fencing surrounds the perimeter of the 6 acres allowing room for horses and cattle to graze. Helicopter fliers can enjoy a landing pad. A gated entrance provides access to the 5,431 sq. ft. foot home with an open floor plan and western charm with four bedroom en-suites, five baths, a bonus room, library, office, gourmet eat-in kitchen, a dramatic living and dining room and a family room with an entertainers bar. Turn-key, the ranch is surrounded by a wide range of tranquil scenery. For additional outdoor enjoyment there is a splash pool with a waterfall, built-in bbq with eating bar, fire pit, expansive patios and five balconies to relax and take full advantage of the peaceful surroundings and breathtaking views. This incredible property awaits the next owner to carry on the legacy." "Step inside the gates and enter your private canyon oasis, the perfect place to relax from a busy day. Located in the rural community of Modjeska Canyon where neighbors greet each other and give a friendly wave when passing by car, bike or horse. Discover all that canyon living offers while enjoying the amenities of a renovated modern home. The spacious kitchen with island provides ample room for meal prep, and opens into the large dining room. The family room with fireplace has a cozy ambiance and access to the rear patio areas. The large master bedroom has its own fireplace with wood burning stove insert. There is enough space to create a master retreat. All bathrooms have been updated. Two downstairs bedrooms can be accessed from the interior spiral staircase or from outside. Additional space is provided by the workshop and large shed. Just minutes to shopping, dining and cinemas. Community events include a 4th of July parade, Halloween potluck, pancake breakfast, and live locals concerts in summer. 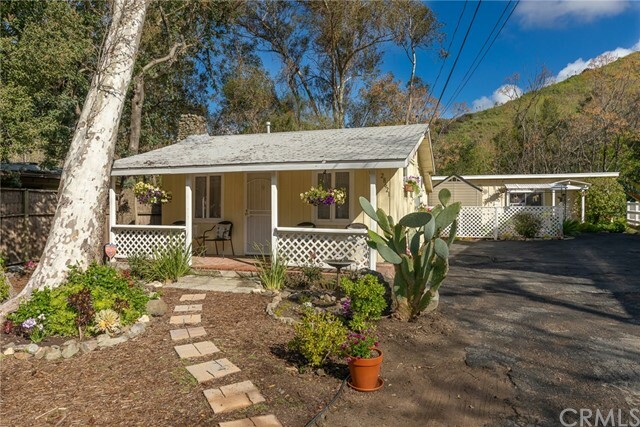 Don t miss out on this rare opportunity to live in a rural setting that is moments from civilization"
"Adorable Kincaid Cottages in Modjeska Canyon. Lovely Sycamore trees shade these two, one bedroom cottages. Features include an inviting front porch, beautiful rock fireplace, and updated flooring. Both cottages have large yards and are set back from the road. This could be a great starter home with the potential for income, or an income producing investment property."